One of the very best ways to work toward beautiful, luminous, glowing skin is through eating well and mindful hydration. Your skin is often a direct reflection of the internal eco-system of your body, and, being nice to your inside is one of the best ways to positively impact your outside. It’s the foundation you need to support good skin, bright eyes, strong hair, thick eyelashes, healthy nails, and on and on. Eating a seasonal, plant-centric, whole foods diet is a great place to start, but I thought I’d take today to highlight a few skin-friendly superstars in this Luminizing Breakfast Beauty Bowl – they’re extra beneficial and skin-supportive, and quite easy to work into your day to day. 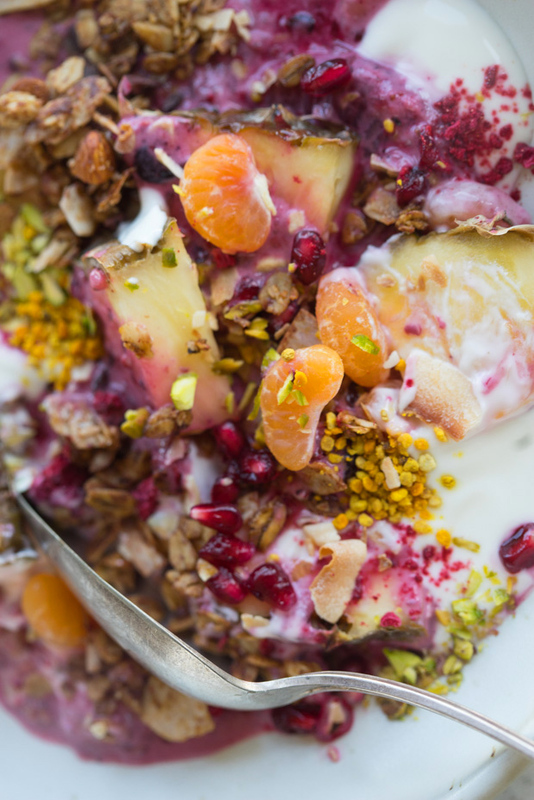 The base of this beauty bowl is a simple mixed berry smoothie boosted with some chia. The berries are compact, anti-oxidant, anti-inflammatory powerhouses, rich in cleansing fiber and collagen-boosting Vitamin C. I use mixed berries (blackberry, blueberry, strawberry) for a bit of diversity (and because they’re quite easy to come by in most freezer sections) but if you really want to step up your Vitamin C game, you might trade in acai for the berries now and then. Switch it up – diversity in your is also important. Use whatever plain, unsweetened, yogurt you prefer – coconut yogurt, Greek yogurt, nut milk yogurt, or sheep or goat milk yogurt – the probiotics here help balance out your digestion and overall internal ecosystem. Use whatever yogurt works for you. Chia helps with tissue repair and skin regeneration. That’s the foundation here. Beyond that, you can boost your beauty bowl with as few or many other ingredients as you have on hand. Pick at least a handful. 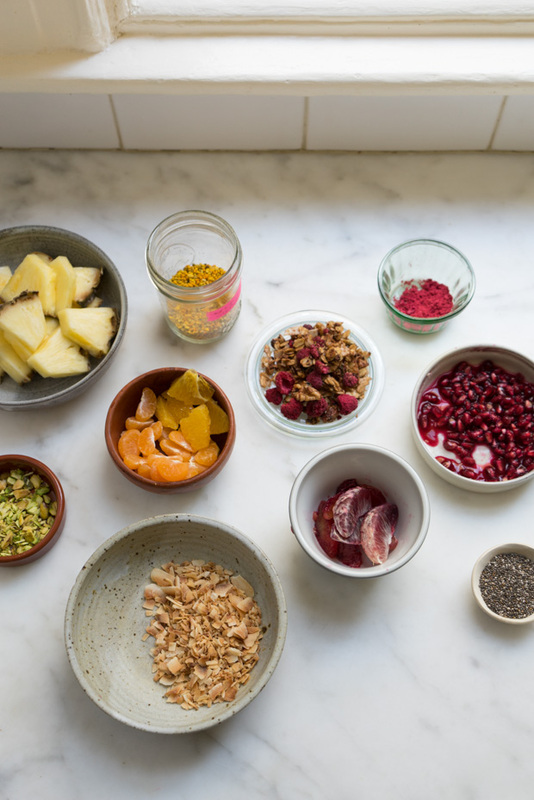 Here (pictured) you see digestion-friendly pineapple wedges, pomegranate seeds (thought to help reduce UV photo damage), Vitamin C-rich citrus (blood oranges and mandarin segments), a sprinkling of nuts and granola, some crushed dehydrated raspberries, and a sprinkling of bee pollen. I love serving this sort of thing as a DIY breakfast option. You can make a big batch of smoothie (pourable straight from the pitcher), and then offer up a “buffet” of toppings. Everyone can customize their own bowl to their liking ;)!